Declared as Asia’s cleanest village in 2003 by Discover India, Mawlynnong is a quaint and serene village in the East Khasi Hills district of Meghalaya. There is an utter sense of cleanliness and hygiene in the village. The pathways and streets in the village are lined with beautiful flowers and swept every now and then. Plastic is totally banned in the village and you will find bamboo dustbins placed at every corner of the streets. Here’s a nice documentary by Wallambok Alexander Kharkongor and team. Check out the Living Roots Bridges which is a smaller and easier alternative for the Double Decker Bridge in Cherrapunjee. 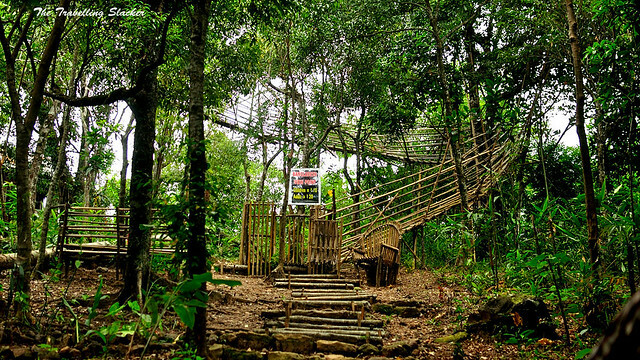 This is ideal for the the not so adventurous travelers who want’s to get an experience of the living roots bridges but don’t want to do a 2+ hours trek of sorts. The entry fee is about 10INR and once you get on the top of the bridge, the view will simply leave you speechless. Also don’t forget to get on the private Sky View to get a bird’s eye-view of the village and bordering country Bangladesh. It’s utterly scenic. Mawlynnong Waterfalls is a fairly popular waterfall in the village. Decked with clean pathways leading up to the falls, the pleasant sounds of gushing waters and the chirping birds will refresh you. The Church of the Epiphany was built in 1902 and is the only church in Mawlynnong village.